"Hey Ted, ask me if the Abominable Snowman called." "Has the Abominable Snowman called?" Known as the Kangchenjunga Demon, Wild Man, Metoh-Kangmi, and surely many others, the yeti gets its name from the Tibetan གཡའ་དྲེད, meaning "rock bear." Pre-Buddhist Himalayans worshiped a "glacier being" as god of the hunt, and would mix its blood with poison and mustard to be used in magical rites. Yetis are often depicted as more ferocious than their American cousins, so this one looking completely bloodthirsty works. His mouth is open to flash his mighty fangs, and he has a tiny nostril slits tucked right up beneath his eyes. It's scary! When these Creatureplica figures were solicited, I didn't pay much attention to them - not because I wasn't interested, but because I knew I'd be getting them all regardless. Jean St.Jean doing a passion project? Sold! Because of that, I thought the Himalayan Yeti was just a repaint of the North American Sasquatch; nothing could be further from the truth! 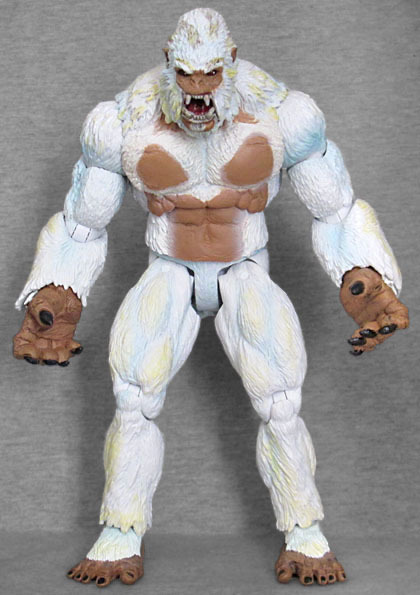 For one thing, the Yeti is about an inch taller than Bigfoot, though that you can't tell until you see them together. 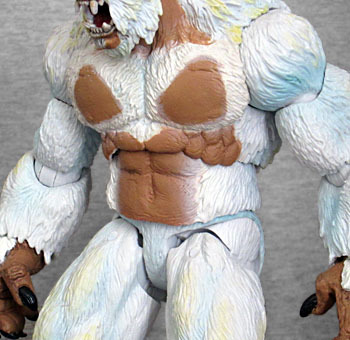 But while the sasquatch was head-to-foot furry, thw yeti has bald patches on his abdomen, chest and throat, similar to the exposed skin on real apes. But wouldn't a yeti need that extra protection? His(?) fingers are thick and chunky, with long black claws. The feet are based on the notorious 1951 photographs taken by British mountaineer Eric Shipton. The big toe ("hallux," to sciency types) is large and offset like a thumb, then there's a gap between the second and third toe, and another between the fourth and fifth. The soles of the feet are flat, so the toy can stand, but this is definitely an inhuman arrangement of foot-fingers. In the old legends, the snowman carried a large stone as a weapon (and made a characteristic whistling sound). This one doesn't get any accessories, but he does have nice articulation. Balljointed ankles and hinged knees reside below H-hips, but the legs are so large that they can't come all the way straight down without bumping into one another. Again, we just get swivels in the waist and chest, which seems superfluous. The wrists are plain swivels as well, but there's also a swivel at the top of the forearm, right below the hinged elbows. Unexpected! The biceps swivel, the shoulders are swivel/hinge, and the head is balljointed. 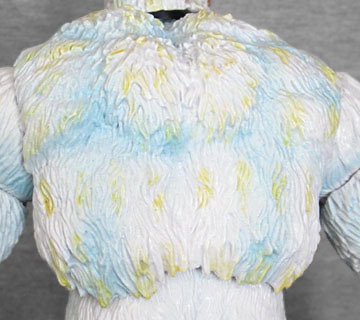 Like the Sasquatch, the Yeti is typically looking down, but he's really got the side to make that work for him! The exposed skin is a tan color, and as we said, the nails are black. Rather than being flat white, the fun has blue shadows and patches of yellow. As the owner of a white dog, I can personally attest and verify that "white" fur often has cream or yellow-colored tints that are unnoticeable until you put them next to a truly white source for contrast (like, say, snow?! ), so that choice is fine. The roof of his mouth is a darker red than his tongue, but it matches the red of his eyes - they're solid red with a black outline and a small white dot as a reflection. 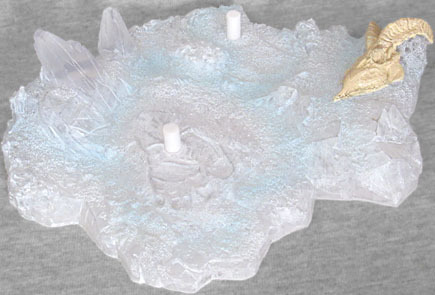 Like the other Creatureplica toys, the yeti has an ornate display base. Fittingly, this is a large patch of snowy ground. It's molded from semi-translucent plastic, so we can get large spikes of ice sticking up through the frost, and there's a yellow mountain goat skull partially buried on the right side. 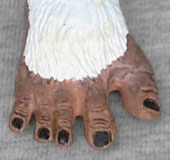 There are two large footpegs to support the figure, and one of his footprints is incredibly detailed - you can even make out the cracks and wrinkles in the sole, and individual toe prints! The other footprint is just a simple depression in the snow. The base measures 5⅞" x 4⅜". 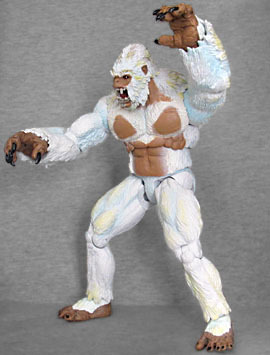 Even if the Yeti had just been a repaint of the Sasquatch, it still would have been a good figure. But without a single shared piece between them, it's even better! The figure is massive and frightening, and if nothing else, will give Lara Croft an actual enemy to fight.